Here you go,im back from the dead. HERE SOME WIP Non - edit. Hope you enjoyed, consider liking the video and possibly subscribing! She gave me her new OC today so I made this wallpaper yay Constructive Feedback is encouraged!!! Thanks for the feedback everyone! This means a lot to me. we want mineimator for the phones! Wait fully 3D? With working bends?! I think I missed something, 'cause last I checked that was impossible. Hi, today I wanted to share with you my Star Wars Lightsaber Rigs that I used in several wallpapers. 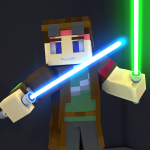 Here are some pictures : ---> Download <--- You will find 3 lightsaber models in the archive. Don't forget to credit me if used. Enjoy ! WE WANT MINEIMATOR FOR THE PHONE!